Yesterday I did the Tinkerfest Public Quest on my Inquisitor. I wasn't planning to, she just happened to be in the zone when it popped and it's fun so she did it. And this dropped. It's a huge, huge upgrade for her. Also, it looks fantastic and it's totally her style. In case it's not clear, the little red dot is the headpiece. It would also be a very significant upgrade for my Berserker, who is my main character in EQ2. Yes, I think I do have to admit I have a main, in this one game, at this particular time. This is what he's currently wearing. And I only just realized it's cloth. What's more, he's been doing that PQ himself, on and off, when he remembers, hoping to get an upgrade (not necessarily that one, there are other possible drops) but so far he's had no luck. Tinkerfest ends today. I don't really have the time to try for it again and even if I did the chances of it dropping are vanishingly small. And here's my dilemma: is it ethical to take the Automated Targeting Eye away from the character who got it and give it to the character who needs it? Who am I to make that decision? At the moment the Berserker has it in his bags but he hasn't equipped it. (He had to borrow it to take the comparison screenshot. Well, that's his story). 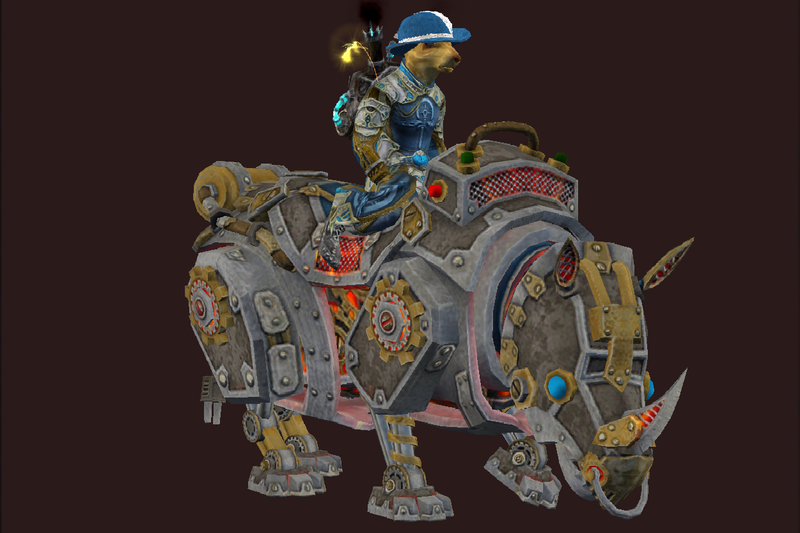 He also has this amazing robot rhino (although it's my Warlock riding it in the picture). The Berserker just bought the rhino with 300 shiny tinkerfest cogs he got by sending his pack pony out gathering. It's a fantastic-looking mount but it's a ground mount only. Is that a fair trade? No, of course it's not. It is a heck of a mount, though. Going to have to think on it. Perhaps the Inquisitor will just decide to be magnanimous. She is a gnome of the cloth after all, even if she does wear plate. And smite people a lot. Or maybe the Berserker will get lucky in Fabled Guk. I hear there are some great drops there. We'll work something out. We're a team, after all. I'm not familiar with EQ2 terminology, but is heirloom the equivalent of an account-bound item? If so, since you can only play one character at a time... make 'em share! I wish. No, "Heirloom" means it's tradeable within your account until someone equips it, after which it becomes soulbound. It's a huge improvement on the old days, when most good items were No Trade and had to stay on the first person who looted them, but it still means that eventually you have to make a choice. That said, I believe there is now a cash shop item that will return a Soulbound item to its previous state. I'd have to log in and check the store to be sure. I do have a ton of imaginary money sitting doing nothing so that could always be an option, if so.